If you’ve been wakeboarding all your life and you’re looking for a new twist, how about a wakeboard with Handlebars? The BikeBoard can offer wakeboarders with increased maneuverability in water, plus the handlebars allow you to create jumps and spins not possible with your ordinary wakeboard. 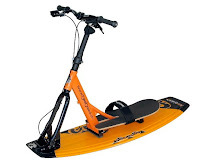 The Bikeboard is also a good way to learn water skiing, this is because what is pulled is the Bikeboard frame, compared with ordinary skis wherein the pulling force is exerted unto the skier. The Bikeboard can be found at Swissbikeboard.com and is only available in Europe. But wakeboards with handlebars are for sissies. What you really need are cool Liquid Force wakeboards found at ModernSkate.com. Awesome!! Usually, love to buy wakeboard from ProBoardShop..